I was looking over my 13 year old son’s shoulder the other day (or, as they say in teen cyberlanguage “POS” for Parent Over Shoulder) and watched his fingers quickly slip toward the enter button on the keyboard. His post, a peacemaking comment about a battle between two of his friends, appeared on the screen among a list of other negative messages about the conflict. Others had gotten much nastier about the problem, degrading into name-calling and accusations that had nothing to do with the situation. Does anybody ever win these “nuclear wars on the two inch screen” that happen on teen facebook pages and cell phones across the country? How do our kids cope with the stress of a battle where each person needs to get in the last insult? Hormones and impulses – hormones can be “emotion intensifiers,” for teens, turning up the volume on excitement, sadness, and, in this case, anger and frustration. Couple these with the impulsivity that is also part of the teen brain, and any perspective they may have had on the size of an argument with a friend online or in texts is lost. The “Invisible Audience” – Ever have the feeling someone is watching? Teens feel this all the time as part of their identity development. Holding up this self-critical mirror on all of their movements, statements, and clothing causes them to lose balance and perspective that might reduce the risk of electronic hostility. The “Hit and Run” Factor in Electronic Communication – Computers and cell phones give us the mistaken feeling that we are communicating with a curtain of invsibility. From birth our brains are developmentally programmed to read and respond to the reactions on other peoples’ faces. Taking away that important feedback loop in communication makes it falsely seem like there are no consequences to what we say or post. With all three of those issues at work on our teens at once, an overly negative or even downright mean post or text is bound to happen. Making those instances less likely is going to take more than taking away electronic privileges after the fact. Instead of using the old consequence and punishment system, try changing the cyberculture in your household. Start by making your computer a “verbal violence” free zone. Talk to your teen about making a mindful choice in what kind of person they want to be in the electronic world, and how to avoid the “she or he said it first” mentality that starts online fights. 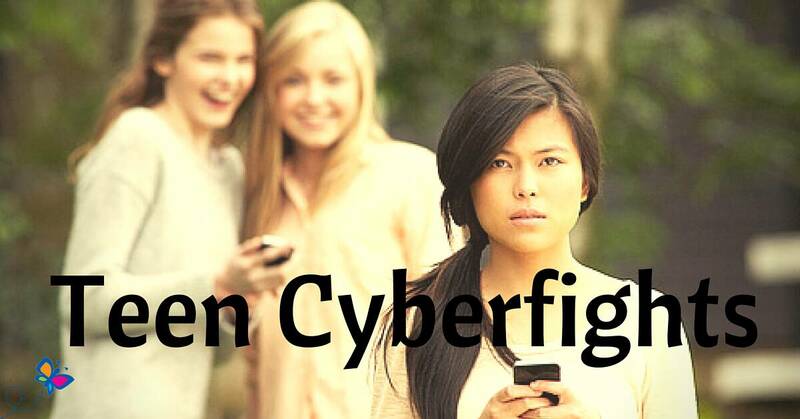 Cybersafety organizations like NetSmartz.org have programs and information for teens and parents that can help start the conversation and get past the “I know”-it is that teens say when we try to help. For more information and suggestions how to help your teen stay safe please see the book Cyber-Savvy Teens: Helping Young People Learn To Use the Internet Safely and Responsibly by Nancy Willard.